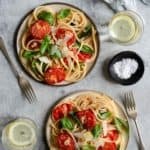 Super-simple bucatini pasta with oven roasted tomatoes and basil! With only 6 ingredients and ready in 15 minutes, it’s a perfect dish for a mid-week dinner for a whole family! And just like that it’s Monday again! Anyone else thinks that weekends should be at least one more day longer? Especially during summer months, there should be an additional day, to celebrate gorgeous weather and delicious food with friends, right? Speaking of delicious food, today’s recipe for bucatini pasta with oven roasted tomatoes and basil will blow your socks off! Why? 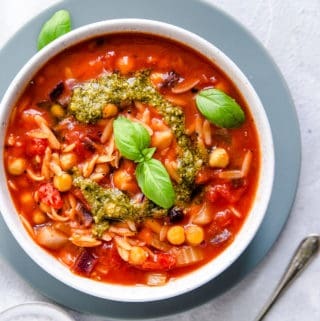 Because it’s one of the quickest and simplest recipes, yet it is bursting with fresh flavours, which we all love! What’s bucatini pasta and why it’s so good? 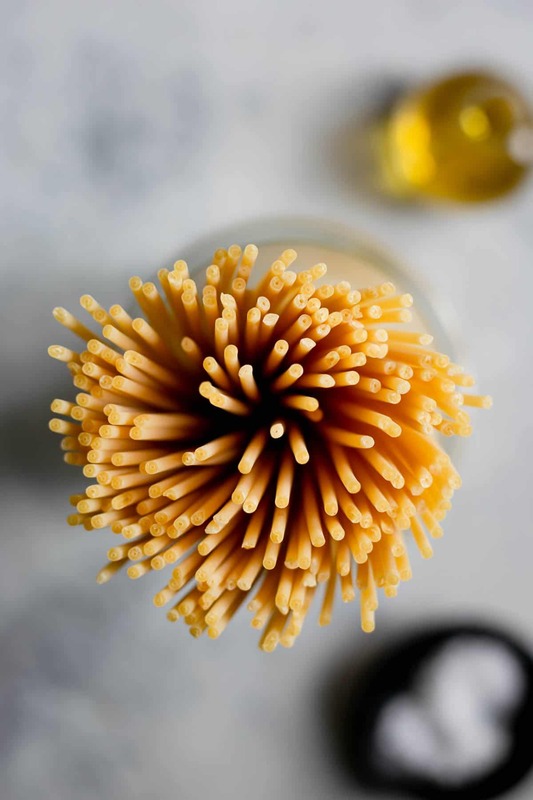 Bucatini pasta is a thick, spaghetti-like pasta with… wait for it… a hole running through the centre. Yup, that’s right. There is a little baby hole, that runs all the way through the noodle! And that is what makes it so special and sooooo good! Because while pastas like spaghetti or linguine get coated with sauce, bucatini gets coated AND filled with sauce! That hollow centre delivers more sauce with each bite! Yummo! To make today’s recipe, you will only need 6 ingredients, and there are high chances you already have most of them in your kitchen! 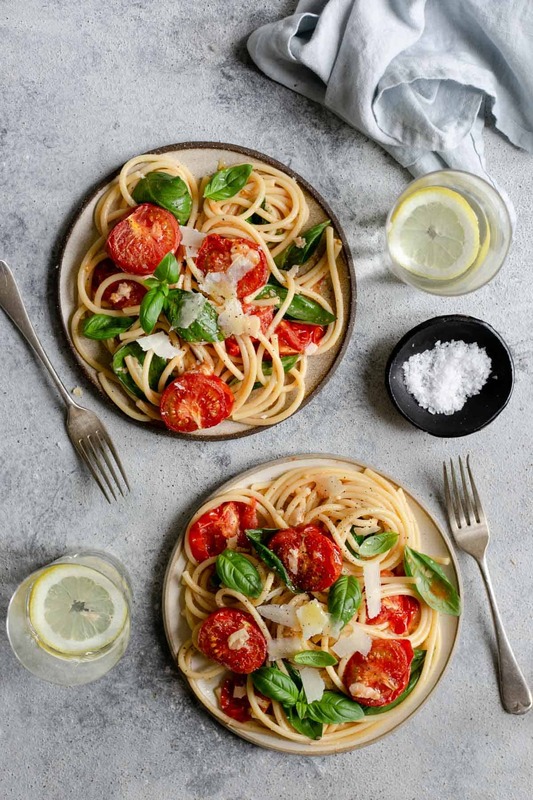 All what it takes to make this beautiful dish is some tomatoes, garlic, olive oil, fresh basil, pasta and Parmesan (I’ve used a vegetarian substitute, you can also use vegan hard cheese equivalent). As for the preparation and instructions, all what you need to do is roast the tomatoes! Easy-peasy, right? Make it for dinner tonight! The whole recipe takes no longer than 20 minutes from start to finish, and it’s a great option for lunch or dinner. It’s also budget friendly! 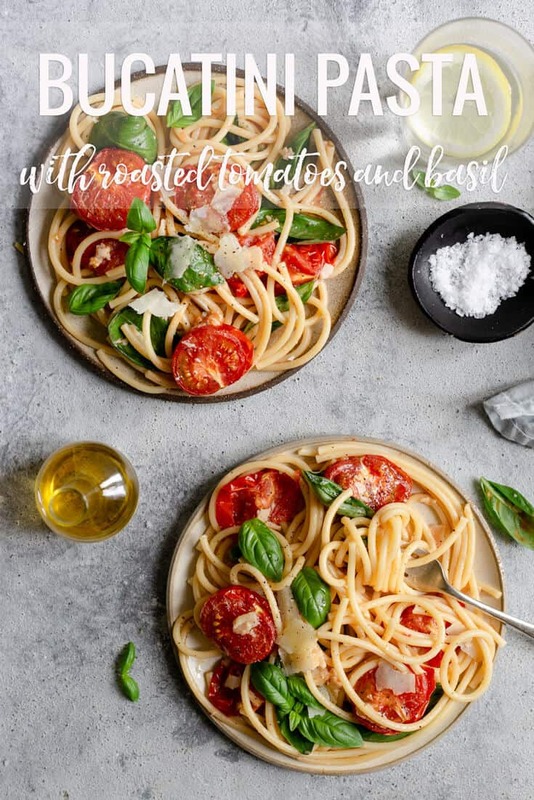 Just like my pesto pasta with cherry tomatoes, this dish takes a minimum of ingredients and effort to prepare, but offers a maximum of flavours, with juicy, sweet tomatoes and fresh, fragrant basil. Classic combination which is a guaranteed crowd pleaser! 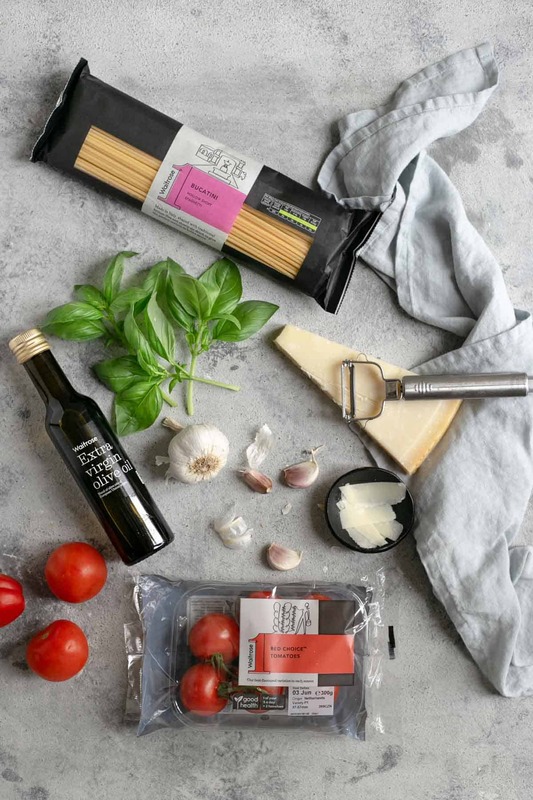 The recipe for this bucatini pasta came from Waitrose, and you can see it in full over here. 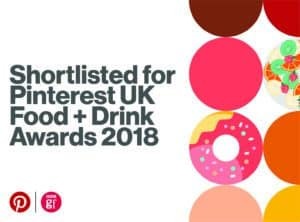 Also, this is not a sponsored post, I just really like that recipe and all-things Waitrose! As always, let me know if you try this recipe, and be sure to leave it a rating too, it will really make my day! 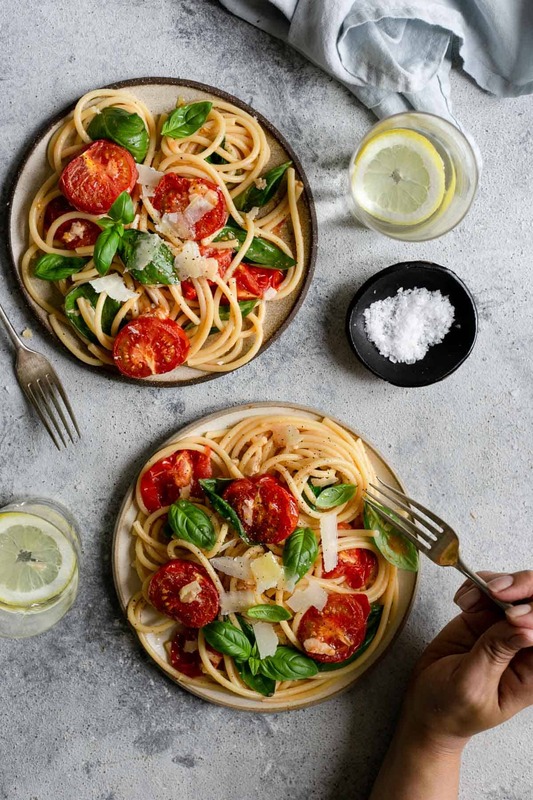 A super simple recipe for bucatini pasta with oven-roasted tomatoes and fresh basil. The ideal meal for lunch or dinner, ready in 15 minutes! 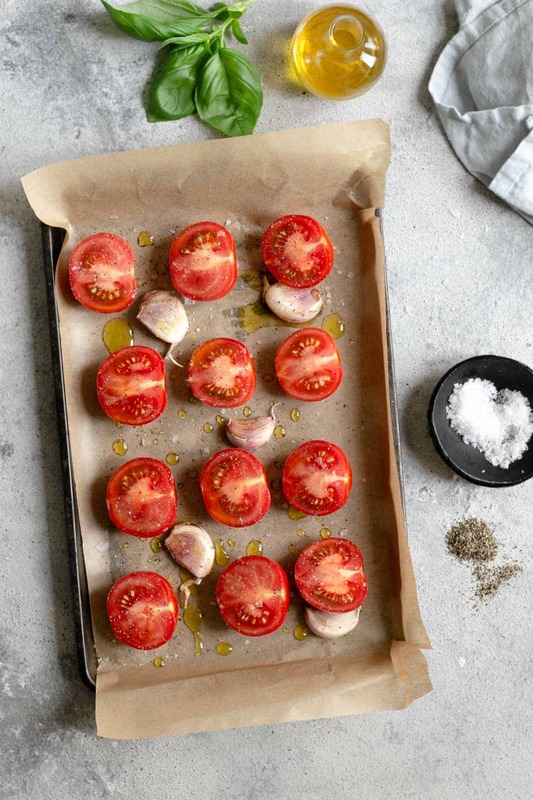 Pre heat the oven to 220 C. Place the tomatoes and garlic cloves in a roasting tin, drizzle with 3 tbsp of olive oil and season with salt and pepper. Roast the tomatoes for 15 minutes, until they are sizzling and the juice starts to come out. Discard the garlic cloves. Meanwhile, cook the bucatitni pasta in boiling salted water for 9 minutes (or until al dente). Make sure to reserve about half cup of the cooking water, then drain the pasta. 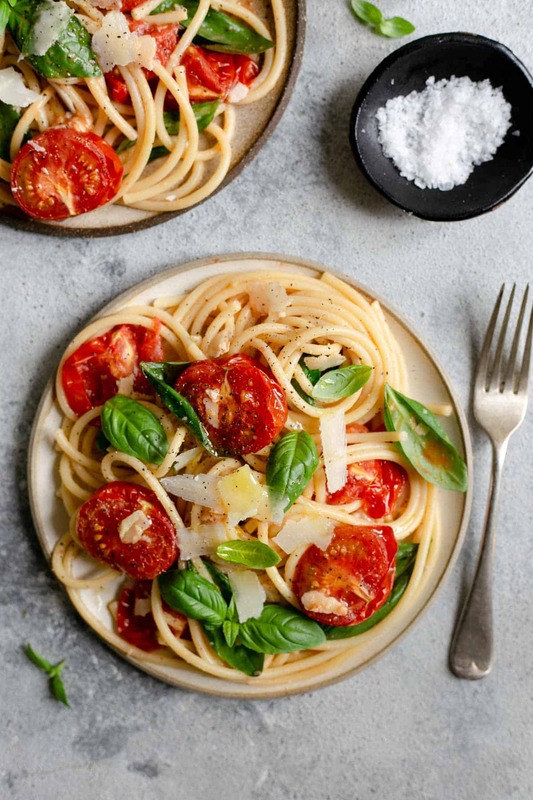 Toss the pasta with 1-2 tbsp of cooking water, larger basil leaves and most of the Parmesan shavings into the tomato pan/tin. Serve scattered with the rest of the cheese and smaller basil leaves. Drizzle with some more olive oil, enjoy! Thanks so much for stopping by Ela! 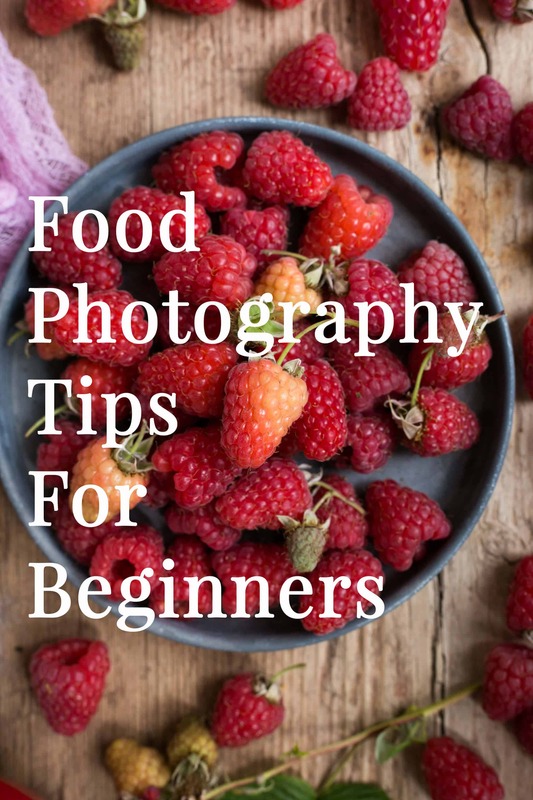 So happy to see you here and hear that you like this recipe! Bucatini for a win! Roasting the tomatoes brings out so much good flavor. 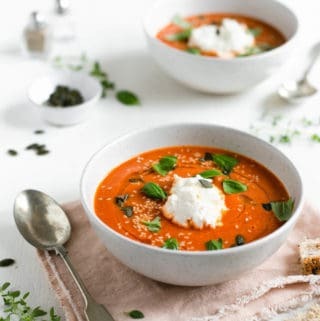 I love how simple and delicious this recipe is. 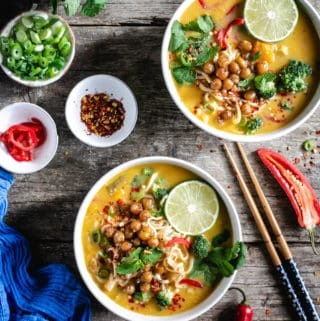 Great for a year round bowl of comfort. Thanks Jenni! so glad to hear that you like the recipe, and yes, roasting any vegetables brings so much more flavour! Can’t wait for the new season’s tomatoes!